A collection of command-line programs for modeling the gravitational potential, acceleration, and gradient tensor. 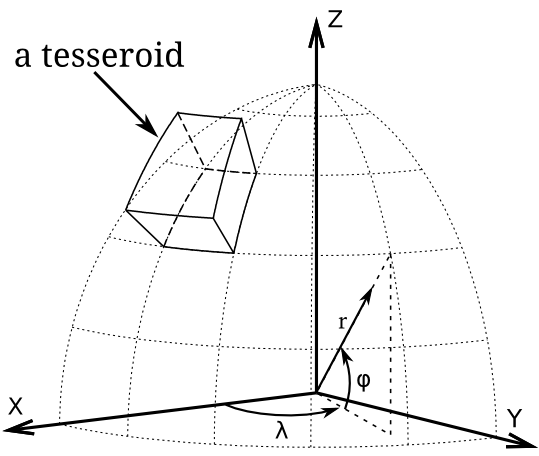 Tesseroids supports models and computation grids in Cartesian and spherical coordinates. Developed by Leonardo Uieda in cooperation with Carla Braitenberg. Tesseroids is research software. Please consider citing it in your publications if you use it for your research. See the list of known issues for things you should be aware of. The geometric element used in the modeling processes is a spherical prism, also called a tesseroid. Tesseroids also contains programs for modeling using right rectangular prisms, both in Cartesian and spherical coordinates. Take a look at the examples in the Cookbook. They contain scripts that run Tesseroids and some Python code to plot the results. If you’re the kind of person who likes to see the equations (who doesn’t? ), see the Theoretical background and the references cited there. For a more detailed description of the software, options, and conventions used, see the usage instructions. Make a regular grid of points. All units either SI or degrees! -r           W/E/S/N: Bounding region of the grid. --version    Print version and license information. -v           Enable verbose printing to stderr. -lFILENAME   Print log messages to file FILENAME. Part of the Tesseroids package. Write an e-mail to Leonardo Uieda, or tweet, or Google Hangout. Even better, submit a bug report/feature request/question to the Github issue tracker.